Students First is a community effort to help youth reach their full potential by pursuing their goals with support from caring adults. During the school year, youth participants meet with Students First Strengths Educators to participate in activities that focus on each individual's strengths. 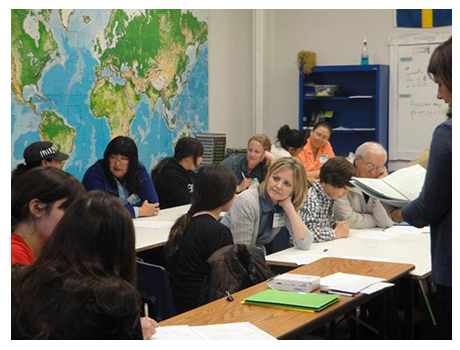 The students create Success Plans that will evolve as they move from 6th to 12th grade. These Plans can include personal, academic, post-secondary, and career goals. Each student is paired with a volunteer Success Coach from the community to support them in reaching these goals. Students First is a community effort to help youth reach their full potential by pursuing their goals with support from caring adults. During the school year, youth participants meet with Students First Strengths Educators to engage in activities that focus on each individual's strengths. The students create Success Plans that will evolve as they move from 6th to 12th grade. These Plans can include personal, academic, post-secondary, and career goals. Each student is paired with a volunteer Success Coach from the community to support them in reaching these goals. Each Students First session is bustling with activity and, most importantly, conversation. Students and their Success Coaches spend time catching up, visiting and taking part in strengths-based activities together. Students learn about their Strengths while they build a trusting relationship with an adult who cares. Success Coaches make a big impact with those monthly 45-minute sessions because they stay with the same student, building a quality relationship with them over the long term. At a time in our culture when we struggle to find ways for youth and adults to connect, Students First is working to build bridges and help students gain the skills necessary to communicate and grow in understanding with someone outside of their peer group. From 6th grade through 12th grade, Students First participants learn and develop their individual Strengths, build a Success Plan, do service projects to give back to the community, plan for high school, plan for post-secondary life, build relationships and learn skills necessary for post-secondary success. Students feel genuinely supported and are more likely to feel rooted and grounded in the community. The community group Bemidji Leads! envisioned the Students First program in 2009 and made its development and implementation a top priority. A community advisory team made up of charter and district school administration, teachers, counselors, parents, county government, business, and youth-serving organizations developed the Students First Operations Plan through an unprecedented collaborative process led by BASC and Headwaters Regional Development Commission. Funds contributed by Northwest Minnesota Foundation, Blandin Foundation, George W. Neilson Foundation, District 31 and TrekNorth were instrumental in the development and pilot phase of the program. Continued support of the program has been provided by District 31, Kelliher School, an Expansion Grant from the Northwest Minnesota Foundation and The Bernick's Beverages and Vending Fund of the Central Minnesota Community Foundation. More than 400 students and 300 community volunteers from District 31 and Kelliher Schools are active in the program.